Information on some mobility issues is readily available for dogs from reputable breeders, who have their dogs tested for hip dysplasia and patellar luxation. For these conditions, test results are recorded in the Orthopedic Foundation for Animal’s (OFA) database, which is accessible online. 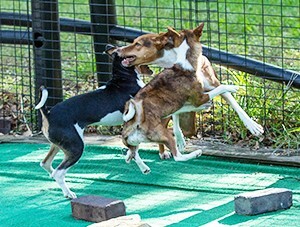 Unfortunately, most dogs we rescue arrive at Camp Basenji without information required to perform this research. Camp Basenji volunteers note and we treat observable mobility issues. But an exam by your vet will provide the best assessment of whether your new besty suffers from these conditions. Holistic vets can offer non-invasive treatments that provide relief. For patellar luxation, for example, administration of Ligaplex II (available on AmazonSmile.com) often is sufficient to tighten ligaments that hold the kneecap in place and avoid surgery. Proper exercise in gradually increasing amounts also can help. And some minimally invasive treatments, if done at a younger age, may enable your besty to enjoy more active senior years. As your besty ages, he will probably experience joint stiffness. We find it helpful to give our dogs a glucosamine supplement, fish oil, and gentle exercise daily. We recommend you consult a holistic vet for supplements and dosages. She may recommend other supplements like MSM or chondroitin. If your Basenji suddenly has difficulty jumping on and off furniture; drops or gets weak in his back end; or suddenly cries in pain when lying down or rising, he may have disc damage, which can take years to manifest. Treatments such as laser therapy may help. Chiropractic treatment also may help. And your vet may prescribe medication to reduce pain. We have had bad experience with the use of Rimadyl (carprofen), including extreme lethargy in several Basenjis, followed by the death of one. While some Basenjis will be fine with that medication, we request that our vets recommend an alternative.